I Have only 1 NEW T8 Silver left ! On Display Never used ! Learn before you Buy ! Come ride them all... worth the trip to get the right Trikke for YOU ! If you are within the Jacksonville area, buying your trikke includes support in learning how to ride. I am an experienced trikker, 1790 miles in 2008 *, Certified Trikke Trainer and have taught many. I have completed the LA Marathon Bike Tour, Long Beach Marathon Bike Tour, Salt Lake City Marathon Bike Tour, 32 of the 50 mile Rosarito to Ensenadas Bike Ride in Mexico, and finished the 5 Boro's New York Bike Tour -42 miles. I have completed the Trikke Century Ride here at the beach 5 times. Aug 09 completed the 100K Trikke Nut Endurance ride in Venura, CA. I have even experienced the thrill of the Trikke Skki in Lake Tahoe and Wolf Mountain in Utah. 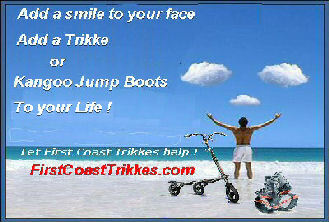 If you have a trikke, I want you to be able to use it and get the physical as well as mental rewards of this new sport. I don't just sell Trikkes, I Trikke ! ProProtandim Learn what it is about !